Being the king of the West Frankish kingdom and, later, Western Emperor. He was the grandson of Charlemagne and youngest son of Louis the Pious. Charles was the son of Louis's second wife Judith, and his half-brothers Pippin, Lothair and Louis the German were pretty much grown when he was born. His birth precipitated a crisis when his father attempted to reorganize the empire to accommodate him at the expense of his brothers. Although matters were ultimately resolved while his father still lived, when Louis died civil war broke out. Pippin had died before their father, but the three surviving brothers fought amongst themselves until Charles joined forces with Louis the German and made Lothair accept the Treaty of Verdun. This agreement divided the empire roughly into three sections, the eastern portion of which went to Louis, the middle portion to Lothair and the western portion to Charles. Because Charles had little support, his hold on his kingdom was tenuous at first. He had to bribe the Vikings to stop attacking his lands and deal with an invasion by Louis the German in 858. 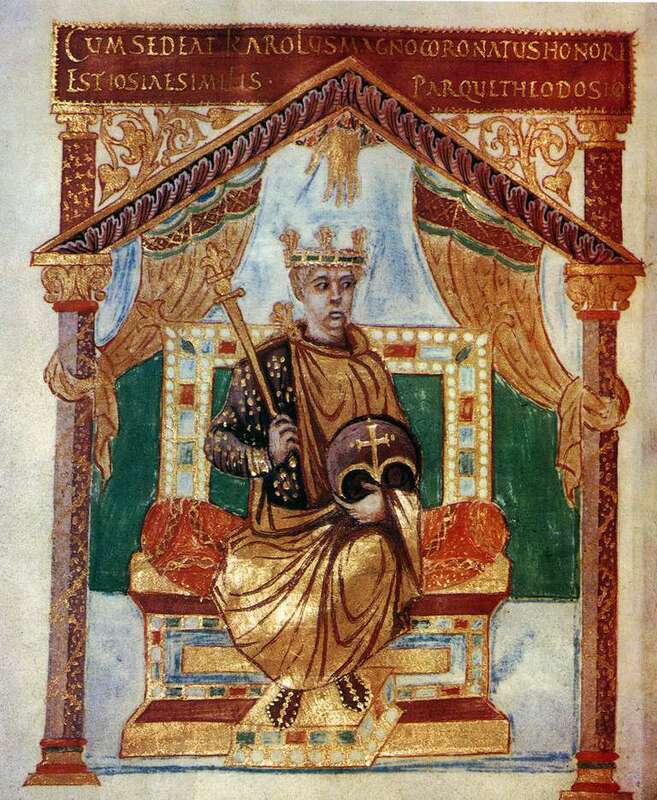 Still, Charles managed to consolidate his holdings, and in 870 he acquired western Lorraine through the Treaty of Meersen. Upon the death of the emperor Louis II (Lothair's son), Charles went to Italy to be crowned emperor by Pope John VIII. When Louis the German died in 876, Charles invaded Louis's lands but was defeated by Louis's son, Louis III the Younger. Charles died a year later while dealing with a revolt by another of Louis's sons, Carloman. The links below will take you to a site where you can compare prices at booksellers across the web. More in-depth info about the book may be found by clicking on to the book's page at one of the online merchants. Modern English translation of the edict at Paul Halsall's Medieval Sourcebook. The text of this document is copyright ©2014 Melissa Snell. You may download or print this document for personal or school use, as long as the URL below is included. Permission is not granted to reproduce this document on another website. For publication permission, please contact Melissa Snell. What was the Treaty of Verdun?